Sleeping by the sea in the Netherlands? Rent one of the fabulous holiday houses on the beach in Kijkduin, The Hague! The beach cottages (or 'Haagse Strandhuisjes' as they are called in Dutch) offer a luxurious and spacious design in a beautiful surrounding. Situated directly along the coast, they all have an uninterrupted view of the North Sea. With the city centre of The Hague a mere 30-minute bike ride from Kijkduin, you can easily complement a vacation at sea with urban activities! The self-catering beach houses are located directly on the wide sandy beach of Kijkduin, The Hague's second beach resort after Scheveningen. The modern huts are decorated in a seaside style with beautiful colours. They can accommodate up to four or five persons. Each cottage has two bedrooms: one with a double bed and with bunk beds. Some homes are equipped with a single sofa bed in the living room. The living room has a sitting area and dining area and adjoins the open kitchen. The bathroom has a shower and a toilet. All accommodations have Wi-Fi access. The cottages are well insulated and equipped with a floor heater - just fabulous for spring and autumn! Beach Resort Kijkduin borders on a wide sandy beach, at the heart of a large swathe of dunes. Not too big, not too small. Kijkduin, The Hague's second beach resort after Scheveningen, has a very cosy feeling about it. In this charming family resort on the south side of The Hague, stylish beach pavilions provide a wealth of enjoyment for children and adults. A variety of beach clubs and restaurants on the boulevard serve organic, fresh and delicious meals. The covered terraces are open all year round and heated in the winter. Sports lovers are also in the right place at Kijkduin. The Sand Motor peninsula, especially for wind and kite surfers, makes this the ideal place to learn the sport. Moreover, Kijkduin is the perfect base for making trips to Scheveningen and the city centre of The Hague, both of which are less than a 30-minute bike ride. The dunes and beach of Kijkduin has a lot to offer to active people. The resort is located on long-distance cycle path LF1 that runs alongside the North Sea. From Kijkduin you can cycle through the dunes on this route to Scheveningen or in the other direction to Hook of Holland and the Port of Rotterdam. Kite surfers have also found the perfect place at the Sand Motor peninsula to practice their sport. This is the definitive place to learn kiting. When the wind blows strongly, the Sand Motor quickly fills up and the sky is swarming with kites. A spectacular sight! Beach Resort Kijkduin provides ample opportunities for dining out throughout the entire year. From March/April to October the beach is filled with lovely beach clubs and in the winter months there is plenty of choice on the boulevard at Kijkduin. All year round you will find Hudson Grill, La Galleria and La Fontaine: plenty of delicious food to choose from and definitely something for everyone. The beach chalets in Kijkduin are easy to reach using various transport options. From the motorway, exit Den Haag Zuid is a short distance from the resort. Kijkduin offers free parking everywhere, which makes the resort the perfect beach location to visit by car. Navigation address for the beach houses is Machiel Vrijenhoeklaan 175 in The Hague. From the parking you can walk through the dunes to the beach in five minutes. Kijkduin is also easy to reach by public transport: buses 23 and 24 travel to Kijkduin. From the last stop, the beach houses are a 600 meter walk through the dunes. Cyclists can follow the European long-distance LF1 path from the Hoek van Holland or Scheveningen. The trip takes you through the magnificent dunescape to Kijkduin! HaagseStrandhuisjes is an initiative of Stichting Leef met de Zee, which creates the opportunity to enjoy the beach while taking care of the environment. They make sure that the beach houses are made of sustainable materials as much as possible. Besides, they use green energy. 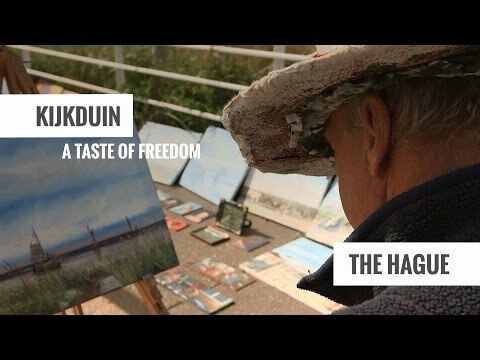 In addition, the organization connects to the environment: they help their guests to familiarize themselves with the recreational, cultural and sports facilities that The Hague and Kijkduin has to offer, and they participate in local and regional debates about the beach. They therefore invite their guests to enjoy the beautiful environment with care and interest at the Beach Houses.